If you knew my stepdad, Jerry May, you know that the things he loved, he obsessed over — and the things he didn’t love, he didn’t want anything to do with. When my mom first married him in 1993, baseball, Springer Spaniels, hot pancakes, and my lovely mother were all among the things that he loved. And I guess you could say that I was among the things he didn’t want anything to do with. One morning, Jerry and I were sitting across from each other at the kitchen table. “Talk to each other,” my mom said. So I kept my distance. I spent long hours playing imaginary games in my room, waiting for moments when I could steal my mom away and be with only her. As an eight year old, I was a silly one (can you just imagine), and I know I talked too much. He was opinionated and quick-tempered, and rather intimidating. The only thing that brought us together was our mutual love for my mom. And that’s the way it was, until the summer of 1995. Seattle fans will tell you that our whole area has been under a “Northwest curse” for years, where playoff appearances and champion rings have been few and far between — if they exist at all. So when a team starts to win, it captures the hearts of the whole city, and everywhere nearby. 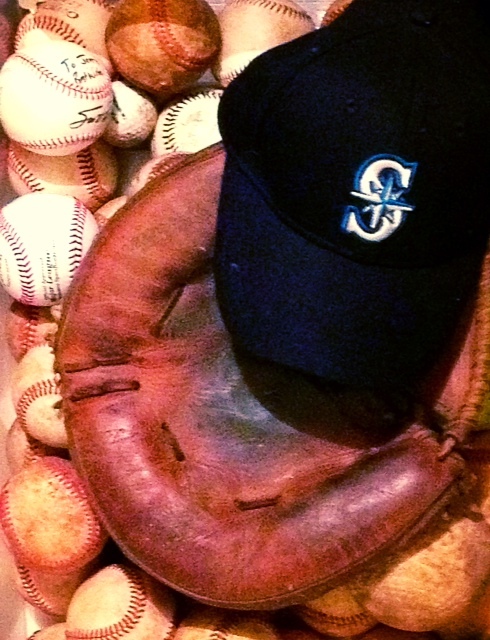 At that time, the Mariners had never been in the playoffs and would fade in the background of every Seattle summer. In August of 1995, as usual, they were over 10 games behind the first-place team in their division, when a peculiar thing happened: the Mariners started to win. They went on a rampage and, surprising everyone, caught up to the first-place Angels. Everyone was talking about it — the people on the news, the lady at the grocery store, the kids at school. We’d make up chants while waiting in line, and turn the radio on to listen to the games during class. I knew nothing about baseball, but even I was hooked. I started to watch the games in my bedroom at night, memorizing the starting line ups and falling in love with the faces of our ragtag, unpretentious Mariners — Joey Cora, Edgar Martinez, Jay Buhner, Ken Griffey, Jr.
And one evening, I’m not even sure why, I mustered up the courage to walk into the kitchen, where my stepdad was also watching the game…and to join him. It became our “thing.” We watched the Mariners win the one-game face off with the Angels — Randy Johnson, his hands pointed up to the sky in victory. We watched as Ken Griffey, Jr. scored the winning run to beat all odds and defeat the Yanks in our first-ever round of playoff games. We watched them right to the end of their crazy ride that year, when they were finally stopped by the Indians — I can still picture Alex Rodriguez wrapping his arm around a weeping Joey Cora in the dugout after the loss. But so much more than baseball was awakened in our hearts that summer. Jerry and I had found something we could enjoy together, and experience together, and hope for together. It opened the door for real relationship, and everything after that was different. I can’t say that Jerry and I were ever especially close, and there are certainly many memories in our family I’d rather forget. But he loved me, and I loved him. He was deep, passionate, emotional. He was a writer, a teacher, an artist, a speaker. In years that followed, it ended up we had much more in common than we had ever known earlier. I’m thankful for those ways that he influenced me, and I’m thankful for that summer, when baseball saved our family and paved the way for all the other good times we shared. Jerry passed away this past April. The Mariners lost for a whole week after that day. Now, they’re back in a playoff race, and I’m thinking it would be pretty special it they made it this year.